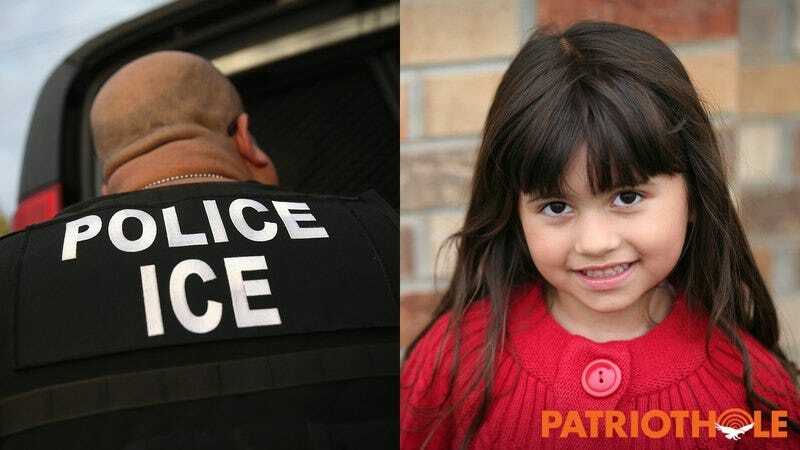 The Latest Evil Immigrant Scheme: Illegal Aliens Are TEAMING UP To Produce MICRO-ILLEGALS That Are Small Enough To Run RIGHT THROUGH An ICE Agent’s LEGS! Patriots, you are not safe: EVIL immigrants have come up with another twisted scheme to worm their way into the MAGNIFICENT United States of America. Illegal aliens are TEAMING UP to produce MICRO-ILLEGALS that are small enough to run RIGHT THROUGH an ICE agent’s LEGS! Disgusting. These HORRIBLE ALIENS will stop at NOTHING in their insane quest to invade our country with their MINISCULE ARMY of ELUSIVE MICRO-IMMIGRANTS! This is nothing short of a COORDINATED EFFORT that has HARDENED ILLEGALS pairing up in NEFARIOUS COUPLES to create TINY, AGILE MIGRANTS capable of fleeing from ICE agents through small spaces such as DOG DOORS and EXTREMELY NARROW ALLEYWAYS. These MICRO-ILLEGALS are UNDER THREE FEET TALL—engineered to a PERFECT SIZE for escaping right from beneath an HONORABLE ICE AGENT’S NOBLE LEGS. Bone-chilling. These SMALL FOREIGNERS created by LARGE FOREIGNERS are PERFECTLY DESIGNED to evade deportation by the brave and attractive ICE agents who keep our country safe from illegals. It is time for PATRIOTS everywhere to SHRIEK WITH FEAR, because there is NOTHING we can do to stop this HORRIFYING TACTIC—pairs of illegal aliens are able to produce MULTIPLE MICRO-ILLEGALS within the span of JUST OVER A YEAR. And each is more UNSTOPPABLY TINY than the next, especially compared to the INCREDIBLY STRONG but UNFORTUNATELY BULKY immigration agents (huge due to MUSCLES) who cannot get their hands around the MICRO-ILLEGALS’ quick tiny bodies in order to DEPORT them from our GORGEOUS NATION. Even as we speak, immigrants are FALLING IN LOVE and GETTING MARRIED in DESPERATE ATTEMPTS to increase the ranks of their PINT-SIZED MILITIA. This truly horrible plot could not be more DEPRAVED or more difficult to CONTAIN. Patriots, the illegals have teamed up against us, and we must find a way to stop them before they can produce any more INVINCIBLE MINI-IMMIGRANTS with the power to hide from ICE agents underneath SMALL BENCHES. Illegal aliens are carrying this scheme out right under our noses. You might have seen members of this LITTLE BATTALION in your own neighborhood being trained to RUN, JUMP, and even RIDE BICYCLES FOR INCREASED MOBILITY. To a true patriot, this EVIL SCHEME is the most TERRIFYING POSSIBLE OFFENSE against our SHINING AMERICA (our GLIMMERING AMERICA). Soon MICRO-ILLEGALS will be darting past our heroic immigration agents and avoiding imprisonment in every town in the UNITED STATES (home of the wonderful cowboy Mr. JOHN WAYNE). We must protect our country from the ITTY-BITTY ILLEGAL ALIENS that EVIL immigrants are generating every day!